The Web 2.0/Social Media revolution presents major opportunities (but also threats) for businesses of all types and sizes. 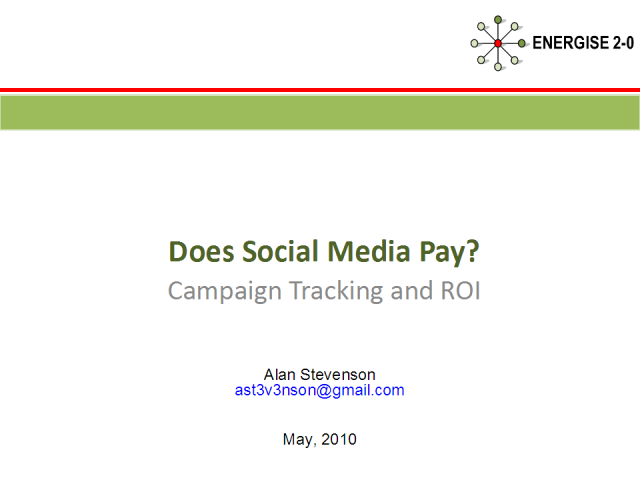 As an acknowledged social media expert, Alan Stevenson will highlight the importance of focusing on and getting a return on your Social Media investment. He will take you on a "social media journey" from asking the question - "does Social Media pay", to challenging the accepted view of web performance, and finally to the definition and practical application of a new set of performance measures for the Social Media era. Alan will provide an overview of Social Media Tracking applications, from free and low cost to the very expensive, and through some relevant worked examples, he will demonstrate the phenomenal power of these tools for your business. Over the last ten years, Alan Stevenson has specialised in creating and implementing Internet and Web 2-0 based marketing strategies for public and private sector organisations. Alan is also heavily involved in visualising, specifying, planning and optimising technology-based solutions with a strong focus on the use of Open Source software and low cost hosted solutions. Alan has co-authored numerous academic articles in the area of Web 2.0, Internet strategy and customer-focused strategy. He has co-developed a Social Media / Web 2.0 Continuous Professional Development programme which he is also helping to run in collaboration with the University of Strathclyde (supported by an e-learning community for Crowdsourced Learning www.web2-0cpd.com). Alan has created and run over the last 2 years a professional networking community for the Global Tourism Industry called Tourism 2-0 (www.tourism2-0.co.uk), it has over 1,700 members and is one of the largest networks of its kind in the world. Alan is a visiting lecturer at the University of Strathclyde and an EU approved management consultant.